"20 CM" IS HOW THEY ARE TESTED FOR RADIATION LEVELS. Please note that there are "Reports of Skin Cancer developing in the burned area". NACST wonders what the cancer risk/effect will be with years of this lap use. Laptops emit heat from the mechanical equipment at work inside them plus the radio frequency radiation they emit from the WIFI antennase. Please note that non thermal effects such as cognitive changes, oxidative stress and damage to reproductive organs occur at levels far far lower than levels that cause heating effects. Sharma G. Burn Injury Caused by Laptop Computers, Ann Med Health Sci Res. Nov 2013; 3(Suppl1): S31–S32. Abstract: Laptop burn is a real condition and medical reports indicate that using a laptop across the legs can indeed cause it. in very rare cases, the condition can cause damage leading to skin cancer. A 24-year-old man presented with an asymptomatic reddish brown pigmentation on the thighs. After an extensive work-up, burning caused by use of a laptop was observed. Burning was induced in 3 days by using laptop for 4 h daily. Laptop should be used in properly ventilated and air-conditioned rooms. The most effective way of preventing erythema is to use the laptop on the table or desk. Paprottka FJ et al. Third-degree burn leading to partial foot amputation--why a notebook is no laptop. Journal of Plastic, Reconstructive & Aesthetic Surgery. 2012 Aug;65(8):1119-22. doi: 10.1016/j.bjps.2011.12.034. Epub 2012 Jan 23. So far a few case reports about laptops causing burns have been published. Now for the first time, we report on a case, in which notebook-induced thermal injuries placed in a patient's lap resulted in severe second- and third-degree burns. As a consequence, a partial amputation of the left foot had to be performed. Furthermore, we measured maximum temperatures of 12 popular laptops, which were running full load for 3 h. For this experiment air circulation underneath the device was blocked in order to simulate surrounding conditions, which were present when the patient got injured. Although this setting may be the reason for most of all notebook burns, this kind of test has not been part of any scientific publication until now. Patients with lower extremity sensation, altered consciousness or decreased peripheral sensitivity have a higher risk for thermal injuries. Arnold A. Laptop Computer–Induced Erythema ab Igne in a Child and Review of the Literature , Pediatrics October 4, 2010. Abstract: We report here the case of a 12-year-old boy with erythema ab igne on his left thigh caused by the use of a laptop computer. This is the youngest of the 10 reported patients with this laptop-induced dermatosis since its first description in 2004. Erythema ab igne is a reticular, pigmented, sometimes telangiectatic dermatosis that is caused by prolonged exposure to a heat or infrared source. In laptop-induced erythema ab igne, the localization on the thighs and asymmetry are characteristic. The heat originates from the optical drive, the battery, or the ventilation fan of the computer. Avendaño C. et al., 2012. Use of laptop computers connected to internet through Wi-Fi decreases human sperm motility and increases sperm DNA fragmentation. Fertility and Sterility 97(1): 39-45. Ex vivo exposure of human spermatozoa to a wireless internet-connected laptop decreased motility and induced DNA fragmentation by a nonthermal effect. Atasoy H.I. et al., 2013. Immunohistopathologic demonstration of deleterious effects on growing rat testes of radiofrequency waves emitted from conventional Wi-Fi devices. Journal of Pediatric Urology. Significant increases in serum 8-hydroxy-2'-deoxyguanosine levels and 8-hydroxyguanosine staining in the testes of the experimental group indicating DNA damage due to exposure (p < 0.05). Want More Research on the non-thermal health effects from microwave radiation? Please go HERE. Laptops on the Lap have resulted in burns to the body. Toasted Skin Warning from Laptops CBS News. This parent shows us the radiation from his cell phone and compares it to his Laptop. 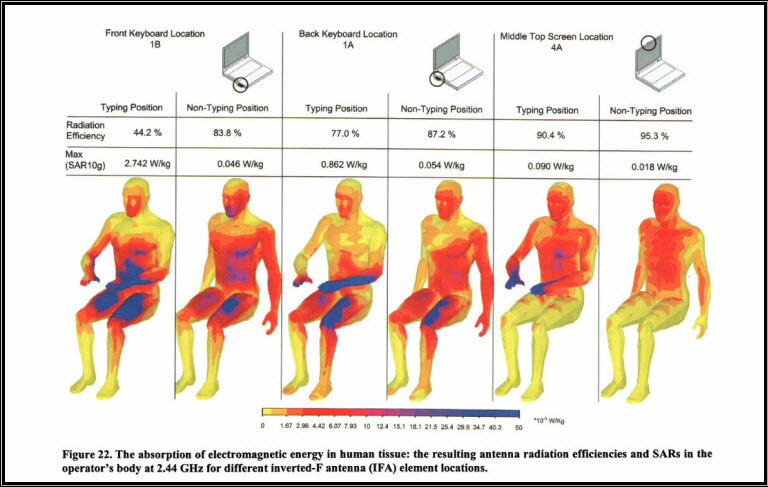 The above picture shows the laptop microwave absorption into a grown male. especially the heart and internal organs. Where are the studies with children and Laptops? Children are not studied so we simply do not know. Laptops emit microwave radiation just like cellphones. Laptops were tested at 20 cm from the body. Laptops have fine print warnings about keeping a distance. They send out bursts of radiation while they are connected to the internet and also while they are simply on. Streaming video produces the highest rates of radiation. 100x Radiation on your Lap? "Laptops" technically are not supposed to be on your lap. That would be "improper" consumer use. They generate high electromagnetic field radiation and the SAR could be up to 100 fold on your lap as opposed to the table. Regulations ONLY consider use at 20 cm (8 inches) from the body. Do you ensure your children have laptops at 8 inches away? 3. Turn Airplane Mode On. 4. Keep Laptops on table.